Behind the produce stalls at the State Farmers Market in Raleigh, out past the fresh-shelled butter beans, beyond the radishes, away from the peaches and the Pink Lady apples, totally apart from the free-range quail eggs and the artisan cheese, there’s a glorious lunch waiting with the best kind of ingredients: Already cooked. The name of this place isn’t the most inventive: N.C. Seafood Restaurant. The decor isn’t something you’d rave about, or even notice. There’s a concrete floor, some strands of nautical rope, and a stuffed marlin with its bill taped to its head. There’s no waitstaff. When you walk in, a guy with a scratch pad takes your order and hands it to another guy back in the kitchen. You pour your own sweet tea. You fetch your own tartar sauce. But it’s about the only place in Raleigh where you’ll find both spot and scallops on the same menu, get croaker served alongside crab cakes, and see oysters and flounder frying next to whitefish. People think of the State Farmers Market as a jumping-off spot for good food. You buy raw collards there. Or tomato plants. Or a whole hog. It’s the place to buy North Carolina’s bounty as a fixing, as one part of a concoction you’ll whip up yourself — later. But locals know the 75-acre campus off Lake Wheeler Road has three of the best spots for a hot meal in Raleigh, all of them hidden inside ordinary square buildings away from the crowded commerce of the market. 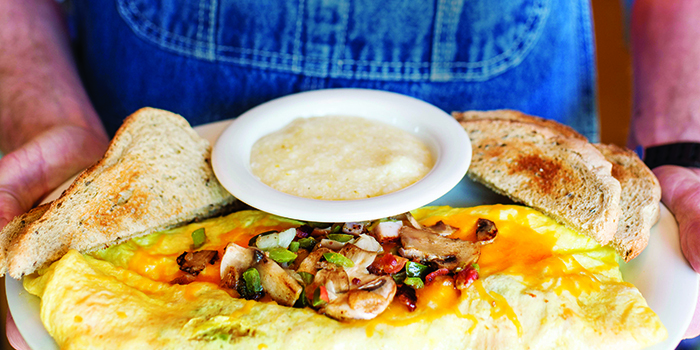 Each of the three restaurants at the State Farmers Market offers a classic Southern specialty. Choose from fried whole flounder; biscuits and hushpuppies; or a hot dog with chili, mustard, and onions. Though not as healthy as the produce available from farmers nearby, these dishes taste like North Carolina. Along with the seafood restaurant, there’s the Farmers Market Restaurant itself. Again, it’s not the most creatively named eatery in the state. But it makes up for that deficiency with a comfort-food menu that often comes straight from the farmers across the way — not to mention biscuits that hold nothing back. You’ll spot congressmen, legislators, and often the state agriculture commissioner bellied up to the tables, hoping that chicken pastry made the daily offerings. Sit at the counter and hear strangers talk about whether UNC-Chapel Hill will replace the Dean Dome and the merits of Carolina Panthers quarterback Cam Newton. Then, up on the Farmers Market hill, tucked inside a low-slung building where the pie vendors dwell, there’s a third option for diners who don’t want to wait. 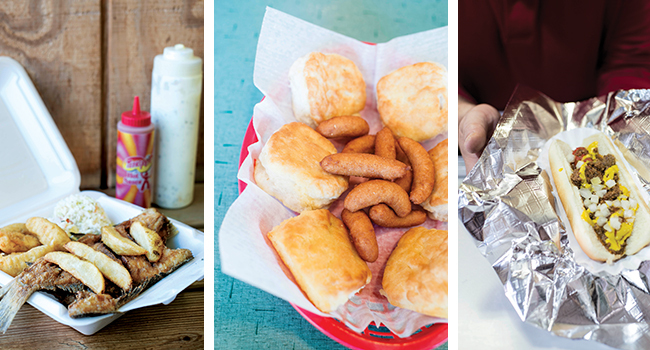 Between the three, it’s a sample platter of any meal you might find from Raleigh to the ocean. Here you find menu items that swam very recently in Pamlico Sound. You eat coleslaw made that morning with a Johnston County farmer’s cabbage. You chew collards bought out of Farmers Market baskets. Perhaps best of all, it’s the kind of quick-and-simple lunch where you get both a handful of napkins and change for your $10 bill. The original Farmers Market Restaurant stood on Hodges Street, built in 1955 on what qualified as Raleigh’s outskirts. A Mr. King ran it then, Raleigh’s old-timers recall, next door to a barber shop and a beer joint. 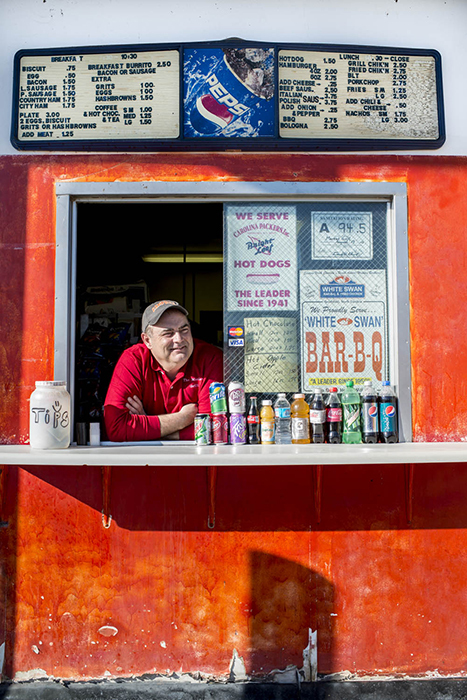 For years, it opened at 5:30 a.m., feeding breakfast to truckers and other early risers. Lunch consisted of fare you’ll hardly see on modern menus: salty ham hocks and cabbage, calves’ liver, chitterlings. In its time, it offered up a daily version of Raleigh’s power lunch, eaten by the city’s most influential people. Parry Register serves Bright Leaf hot dogs and White Swan barbecue, both North Carolina food products, from his walk-up window at Market Grill. Former state Agriculture Commissioner Jim Graham, the legendary “Sodfather,” ate there almost every day, occupying a special antique table made out of bedposts. Then-owner “Big Ed” Watkins created a special Jim Graham biscuit, flavored with an onion slice, a tomato slice, a dollop of mayonnaise, and a streak o’ lean — fatback with some meat still attached. The biggest wheels in the city joined him at that table, including Sen. Jesse Helms and Willie York, the developer whose company built Memorial Auditorium and the Sir Walter Hotel. Watkins later turned the restaurant over to his son, Jackie, who ran it for 14 years, opening the new location off Lake Wheeler Road. He once bid on a prize-winning 141-pound watermelon, then promised to keep it on display in the restaurant as long as it stayed good. After Jackie died in 1995, new blood took over the business. In walked Gypsy Gilliam, who had previously run Gypsy’s Shiny Diner in Cary, and who still operates the Farmers Market Restaurant. She loves its high ceilings and its decorations: the pig in high heels out front, the locomotive mural snaking around the walls, the portraits of Middlesex High School and Samaria Baptist Church hanging on the walls. The seafood restaurant that now stands a few hundred yards away appeared several years later, but it evolved slowly and accidentally. In the beginning, it was a glorified fresh fish stand, not much different from what the farmers set up for collards. Then the market started frying up a little shrimp on the side, which brought in an uncomfortable mix of fish-buyers and fish-eaters. Nobody wanted to eat a shrimp sandwich next to a fish that still had eyes and a head attached. What people wanted was a simple place that reminded them of the beach. No frills. You practically serve yourself. The only trouble with buying fresh fruit and vegetables is having to actually cook them. Somehow, the collards you buy raw and big as an elephant’s ear never taste quite as good as they do at the local meat-and-three. At the State Farmers Market, if you want a pork chop you can eat with a spoon, or a muscadine cider slushie, you can skip the intimidation of a Southern cookbook. Which is one reason these restaurants are so appealing, especially to the crowds of Saturday morning shoppers. But you have to know these places exist. There’s hardly a sign out front. Finding them is as satisfying as spotting the first farmer selling spring onions and wild leeks at the market.